Magnets get moved until there is shalom in the home. Or until the general manager declares the negotiations over and begins shouting about doing the actual chores. This week, though, the girls brought an old grievance to the family meeting: allowances. I’m not opposed to allowances. Kids can learn a lot from money management. I just can’t remember to give them regularly and I never have actual cash in my purse. I’ve asked, but these kids won’t let me swipe my debit card. So, we asked how much allowance they thought was fair. Laughing all around. “How about $1 per week?” Her dad countered. “So, you don’t want an allowance?” I asked. “I think $5 is a good amount for me,” Sissy suggested. Ever the voice of reason. “Or maybe we should get $1 for our ages.” Did she just up her own offer? “Fair? What’s up with that? How many Lalaloopsies does she get?” Suddenly, Lalaloopsy became our currency and we were stuck in a Seinfeld episode. Clearly, the general manager is going to need a raise. 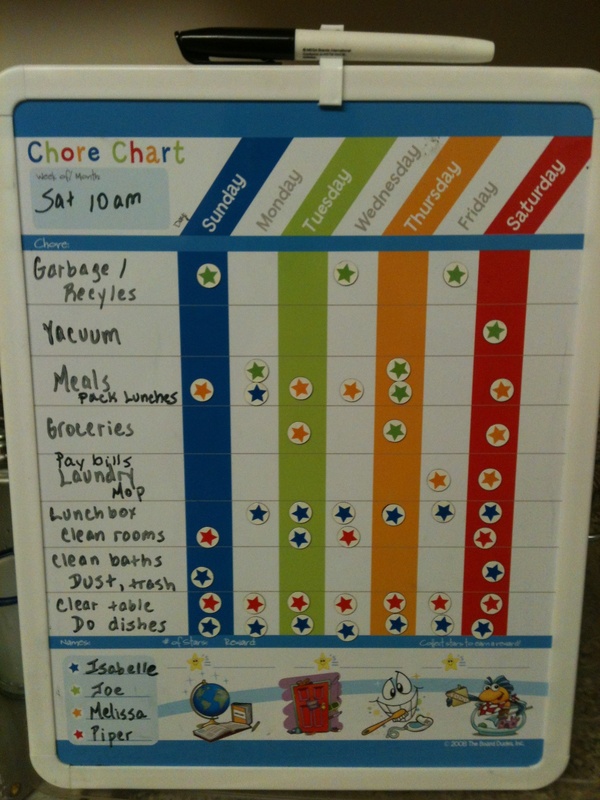 This entry was posted in Daily Dharma and tagged allowances, chore charts, chores, general manager, lalaloopsy, negotiations, piperism by melissa.scholes.young. Bookmark the permalink. Well played Piper! I love this girl! She’s always known exactly what she wants…and mostly how to get it. I have to admire her tactics. They usually work. Awesome. I’ll let Piper know immediately that Uncle Big Bear will be sending her a check for her weekly allowance. Problem solved. Thanks, brother. Lalaloopsy is a big deal at our house & has become currency as well. “Dor” gets to stay with Emma when she’s behaved/completed chores, etc. “Dot” resides in Mama’s room when above is not up to par. Effective system so far. You are way ahead of me, Reagan. I had to google lalaloopsy just to find out what P was talking about. I thought, understandably so, that she was making up more vocabulary.